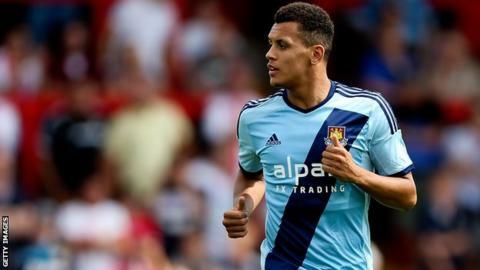 West Ham have terminated the contract of England Under-21 midfielder Ravel Morrison with immediate effect. The 22-year-old, whose contract was due to expire this summer, joined the Hammers from Manchester United in 2012. But he did not establish a first-team place and after a number of loan spells he travelled to Italy last month for talks with Lazio. A statement from the Premier League club said: "We would like to wish Ravel every success in his future career." Morrison joined West Ham after United manager Sir Alex Ferguson labelled his contract demands "unrealistic" and said he was "better out of Manchester". After just one Championship appearance for the Hammers in the second half of the 2011-12 season Morrison was sent out on a season-long loan to Birmingham City. Subsequent loan spells at QPR and Cardiff City followed as Morrison racked up just 18 league appearances for West Ham in three years. Morrison travelled to Italy with West Ham's consent in order to sign a pre-contract agreement with Lazio last month.